Halloumi is a Cypriot cheese made from a mixture of goat’s, sheep’s and cow’s milk. The great thing about this cheese is that it doesn’t melt, so it’s perfect for frying and grilling. 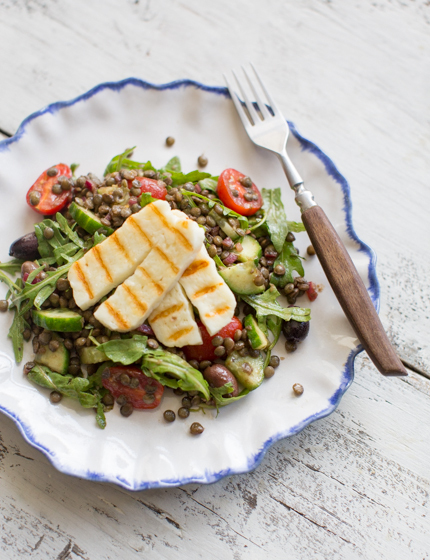 I’ve topped this Greek-inspired lentil salad with halloumi steaks, to add some cheesy saltiness to this hearty salad. Rinse the lentils and put into a saucepan with 2 ½ cups of water and the powdered vegetable stock. Cover and bring to the boil, cook for 20 minutes until all the liquid’s absorbed. Put the lentils into a large serving bowl and leave to cool. Once the lentils are cooled, finely chop the red onion and put into a little bowl with the balsamic vinegar and olive oil. Season with salt and pepper, mix and set aside to macerate while preparing the vegetables. Cut the cucumber into dice, cut the cherry tomatoes in half and add to the lentils with the black olives. Cut the halloumi into 8 slices. Heat a griddle pan and grill the halloumi slices on both sides until soft and charred in spots, about 2 minutes. 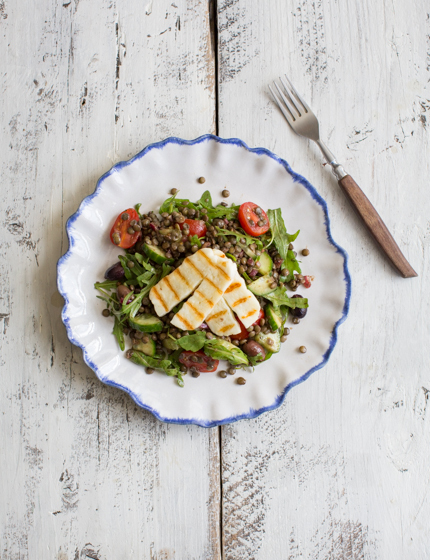 Pour the olive oil dressing onto the lentils, toss through the arugula and distribute the salad between four plates, topping each with two slices of grilled halloumi.